In the middle of a forest clearing, in the shelter of a venerable oak, all cosily snuggled together, lives an adorable family of rabbits and mice - the Mirabelle family. Chicoré the daddy mouse is made of marled jersey and is dressed in grey linen dungarees and a floral cotton shirt. 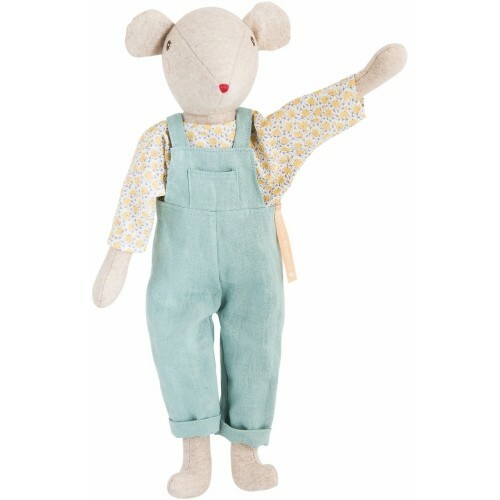 A timeless soft toy with an embroidered face, gorgeous pink cheeks and flowery eyes dressed in real fabric clothes, to dress and undress, to take out and about. Dimension: 44 cm. Materials: Cotton, acrylic, elastane, linen. Wash at 30 degrees on a delicate cycle. Do not tumble dry. Suitable from birth.